← Aboriginal Health #ThePointNITV and Stolen Generation : Guilty of Being Aboriginal reveals the nation-wide practice of giving #StolenGeneration children criminal records. “Historically, research has tended to be based around academic promotion, not looking at what works and what doesn’t and not designed around the needs of Aboriginal people and by Aboriginal people. That’s where we’ve come from. 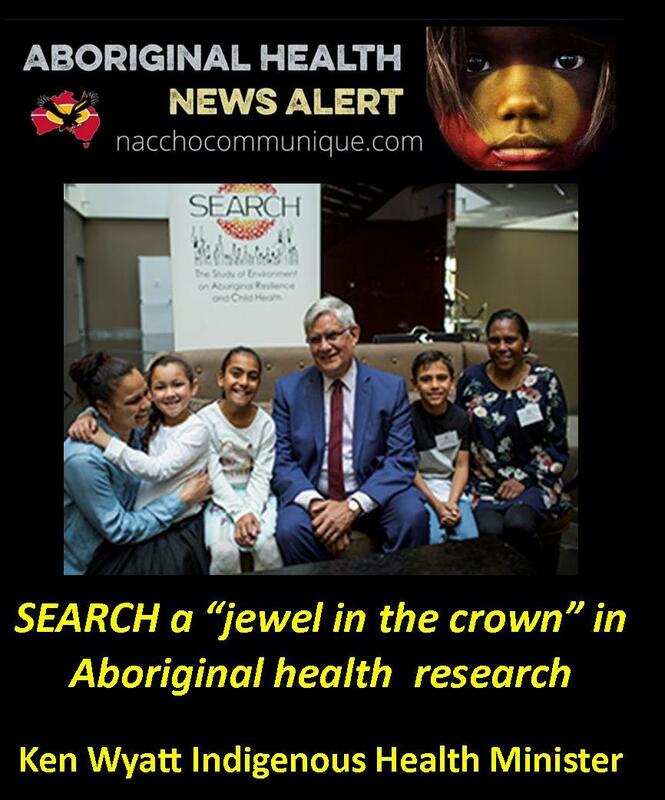 The SEARCH study into the health and wellbeing of urban Aboriginal children is providing valuable data to inform policy and should be celebrated as one of the “jewels in the crown” in Aboriginal care and research, Federal Minister for Indigenous Health Ken Wyatt told the study’s annual Forum this month. The SEARCH partners are: The Aboriginal Health & Medical Research Council, the Sax Institute, leading researchers across Australian universities and four NACCHO Aboriginal community controlled health services member : Tharawal Aboriginal Corporation (Campbelltown), Awabakal Ltd (Newcastle), Riverina Medical and Dental Aboriginal Corporation (Wagga Wagga) and Aboriginal Medical Service Western Sydney (Mt Druitt). Mr Wyatt, who opened the SEARCH (Study of Environment on Aboriginal Resilience and Child Health) Forum in Sydney, said thorough research and data collection was essential in the development of policy. “We are better off informed by data that comes from our people and often collaborations with research institutes give me guidance,” he said. “It really does inform the way we consider our approach to Closing the Gap”. SEARCH is Australia’s largest long-term study of the health and wellbeing of urban Aboriginal children, and involves 1600 children and their families. It is an active partnership between Aboriginal Community Controlled Health Services and researchers, where these health services set the research priorities and guide how data is collected, interpreted and used. The Forum showcased the achievements of SEARCH and highlighted significant potential for Australia to make even greater gains, both by looking at ways to further build the evidence on the drivers of health and disease in urban Aboriginal children and their families, and by using the necessary tools, systems and partnerships to put that evidence to work to achieve large-scale change. Mr Wyatt said SEARCH represented a new way forward in Aboriginal health research, because it put Aboriginal people at the centre of the research process, and sought not only to better understand the health of Aboriginal children, but to make a real difference to the lives of Aboriginal people. SEARCH was one of the many “jewels in the crown” – or shining examples of life-changing care and research that were leading to healthier children – that should be celebrated, Mr Wyatt said. One of the founding Chief Investigators of SEARCH, Sandra Bailey, told the Forum that despite most Aboriginal people living in urban areas, at the time SEARCH was established only 11% of Aboriginal health research focused on understanding health and disease in urban communities. But SEARCH was different because it ensured Aboriginal leadership was embedded, Aboriginal people had ownership of the data and the research was culturally appropriate, she said. Ms Bailey said Aboriginal Community Controlled Health Services were able to directly apply the data from the Study to their service planning and delivery. Sax Institute Chief Executive Officer Professor Sally Redman said SEARCH data was driving real change, including leading to programs such as HEALs, which had used the findings about high rates of ear infections and hearing loss in urban Aboriginal children to deliver improved services. SEARCH, while already valuable, would prove even more valuable in the future, she said. “As the children grow older, we can look at the trajectories of change − what helps some children do well, and some not so well, and the data will be valuable for use in evaluating changes in service delivery,” Professor Redman said.